Also Recommended: Code Geass, Eureka Seven, Deadman Wonderland and any other futuristic show where an angsty male meets a mysterious female. Notes: An original property broadcast on Fuji TV's niotaminA block from October 2011 to March 2012. The story takes place in Tokyo in 2039. After the outbreak of the unidentified virus "Lost Christmas" in 2029, Japan has been under the control of a multinational organization called GHQ. Ouma Shu is a 17-year-old boy who gains an incredible ability in his right hand. He can use the power "Ability of King" to extract tools or weapons from his others his age, different ones unique to each individual. He has been avoiding making trouble for others but his life changes when he meets a girl named Yuzuriha Inori, a member of a resistance guerrilla group called "Funeral Parlour" (a.k.a. "Undertaker"), and becomes embroiled in a revolution to free Japan from its oppressors. I don't like to think of dystopian future anime as a genre; I like to think of it as a tradition. When I say "tradition", I mean it in the rigid, uncompromising sense described in the great stage musical Fiddler on the Roof. I'm pretty sure that in twenty years time, in a Japan where Evangelion is older than most anime makers, they won't even remember why angsty boys of destiny and stoic girls of mystery gravitate to one another like sunlight to a black hole, but they still will and always will. One thing that will surprise you about Guilty Crown is that for a dystopian Japan, there is a conspicuous lack of mecha. Oh yes they are there, and you can bet that they take a strong role in the action sequences, but only one of the main characters in the show actually pilots one; they mostly exist to provide inhuman enemies for Shu to show off his shiny, impressive powers against (they are piloted remotely if at all). Sadly, that is the only thing about Guilty Crown that is going to surprise you. Have you seen Eureka 7? Have you seen Deadman Wonderland? Have you seen Code Geass? If you said yes, then you have already seen everything that Guilty Crown has to offer in the way of plot and story. It's true that the details are different, but the results, methods, character dynamics - everything that makes up the construction of a 'traditional' dystopian sci-fi anime is there, with only cosmetic changes to warrant the shows existence. That all said I could live with that. If the only problems with the show were that it were just like every other anime of its type, I would just say don't bother if you've seen any of the other shows like it unless you want to see more of the same but if you haven't seen its like then go for it. That is not the case, however. Guilty Crown might have all of the defining features of a show of its type, but it's brought in a few new problems. The first is pacing. There was a rather cruel and facetious rumour going around that the production had hired a new writing team halfway through the show, fired them, and then hired a third. And to be honest, it feels like it. I never felt like there was a natural progression to the story; everything about the plot and the reveals jerked around so much I felt like I was going to get whiplash. Everything about the exposition the series offered arrived like how I empty my bins. It waited until the mysteries and conspiracies were overflowing before dumping it all in one go. It's a bad way to empty the bins, and a terrible way of storytelling. The next problem was the cast. Now, leaving aside the standard complaints of the protagonist being a whiny, annoying twit (he gets better) and the girl having no personality (she doesn't), the trick of these series is to have a strong supporting cast to add a bit of passing grade depth to the proceedings but Guilty Crown totally fails in this regard. What makes it worse is that the series makes obvious attempts to make the characters more sympathetic and interesting, but it just simply fails to achieve that aim. Firstly, I think the characters themselves were inadequate - they are almost universally too much like characters from other shows and almost universally bland even outside the problem of being cliche. Secondly, the show mistakes back story with depth. That might sound odd but bear with me. When a character's history bears no relevance to the story at large, it is more like a post-it note stuck to each of their assembled foreheads than a real personality, a description devoid of relation to the character. History needs to feel lived in to feel and be real. It's the same with characters, and Guilty Crown doesn't have that. Too much of what we're given concerning these characters and a good number of the characters are completely superfluous. This show does have its own strengths, though. If there is any one positive thing to say about Guilty Crown without fear of controversy then it is that the show is beautiful. Production I.G. has never been one to scrimp on aesthetics, but Guilty Crown is its own jewel in terms of music, visual flare and design from the characters to the setting, to the set pieces. The show goes all out with its super-power scenes, and the action is rarely if ever boring. It's downright cool to be honest. So what is Guilty Crown then? It is a beautiful and messy version of what has come many times before. To be fair to it, along with all the negatives of its tradition, it has captured the majority of the strengths too. The story is interesting and exciting (even if the pacing is jarring), the action scenes are every bit as eye-catching and enjoyable as you might reasonably hope, and the base concept is strong premise to explore its themes, which it does adequately. 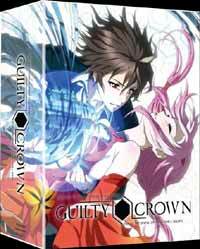 Overall, Guilty Crown is a fairly competent show with faults that are never too alienating. It's still a long way down my list of shows I'd recommend though. Recommended Audience: Compared to the violence, which it rarely shies away from, the fanservice is barely worth mentioning but it is there along with severed limbs, gunshot deaths and various other possibly distressing scenes. Not for children in any case.